Appendix : Continental Box Types. This page shows some of the different types of box that have been produced to house C100, and 63000 teams. As with most of this site, these boxes are scanned from my own collection, and the page is therefore incomplete and ongoing. I'll add other pictures when I get them. While scanning the alternate advertising on the backs of 1980s boxes, it occurred to me that this page may have fallen over the boundary between "informative" and "sad". Oh well, it is just an appendix - take it or leave it. January 2010: I've revamped this page to show more variations in the 1960s box, and more little variations elsewhere. From the White box in 1961 until the mid 1970s, the team boxes measured 215mm x 93mm x 30mm, and had card interiors displaying the team. These tend to be called "long boxes" in collecting circles. Whilst dating the individual box types and interior innovations should be straightforward, nothing in Subbuteo ever is. The main problem is that teams did not get put back into their original boxes, or the wrong lids were put back on (I mixed a couple up just arranging photos for this page....). In addition, many boxes no longer have their number stickers, so even knowing how high number-wise each box reached is not easy. The White Box Circa 1961-62? When the OO scale teams were first launched at the start of the 1960s, they appeared in a dull all-white box, with blue and red writing. The 1950s footballer logo was used on this original box, so I have seen it suggested that these boxes were produced in the late 1950s. However, it is clear from the catalogues that the heavyweight teams were not issued until late 1961/early 1962. The 1960s logo shown on the green boxes below was actually in use by this date (it appears on the flaps of the "blue box" flat editions from the mid 1950s). However, Peter Adolph still had this earlier logo on his notepaper. Note that the insert colour matches the box. The early footballer logo was also used on Set U, the fixture cards, and I've used that set for the close-up shown here. The Standard Old Heavyweight Box circa 1963-68. Original Font (c1963-64):- This was the first box to have a green lid, with the writing on the box switched to black. The logo was changed to the 1960s version, but the general layout of the lid was identical to the white version. The green area on this box was longer than on later versions, and the text more spaced out. The box was made of a thick brown card, which was covered in a thinner white layer, which had the details printed on it. On the inside you can see that the thick card is not jointed at box corners. The corners are fixed using the outer layer, and a visible strengthening strip underneath. On the box shown, the white layer does not cover the underneath surface of the box, which was left as plain brown card. The middle picture shows an "original font" box next to a "cut-lid" box. Note that the green area is longer, and the font is different. These are the first boxes with the standard box font. All the cut boxes I've seen have the shorter green area, and more familiar font. However, the box construction is the same as the Original Font box, rather than the more common stapled or folded versions. The window is always cut in a similar way, on three sides. Whether the window still exists, or not, three sides are cut cleanly, whilst the left-hand edge looks serrated. This type of folding window only works with the early boxes, where the thin white layer keeps the lid on the box. I have been told that the boxes were sold cut, with a piece of cellophane glued to the inside to keep the team safe. This is usually missing, but the glue marks on the inside of the lid are usually very clear (I admit these could be made by cellotape). I have one of these boxes numbered as reference 45, which was introduced in 1965. That gives a reasonable date, and suggests that the original font version must be prior to this. Stapled Ends (c1965-67):- This is the most common variation for this type of box. The bottom of the box is still constructed in the old way, but the lid is much simplified. The green and black printing is now straight onto the thick card (which has a white outside, and grey interior). The long sides have extra flaps with are simply tucked inside and stapled. There can be two staples on each end or four, and they can be horizontal or vertical. This type of box was current when the classic long sleeved heavyweight arrived in 1967, and some of those teams do appear in this box. For example, my classic heavyweight ref 40 with hoops, which dates to the 1967-68 season, is in this style of box lid. The version shown is a named box World Cup team from 1966. Folded Ends (c1967-68):- This more sophisticated version is the first use of the construction technique used in the 1970s long boxes. Here both the lid and the box itself had a complicated design with a set of flaps that interlocked providing a secure, strengthened end product. Most of the teams I own in this box type are classic long sleeved heavyweights, including a green ref 54 Plymouth, which dates to 1968-69, although sadly, this is not numbered. However, I do own a short-sleeved ref. 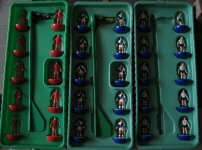 four in a numbered box of this style, so the box and/or figures do overlap with the stapled version, although this is hardly a surprise with Subbuteo. It is also worth noting that the goalkeeper in the Celtic team shown here is of a later type, and the interior of the box reflects that with a different cut for the keeper. Although both of these are items could have been swapped at any time, this change does reflect in other folded-end boxes that I own. Box numbers seem to like these 1960s boxes, and remain stuck to them more often than the 1970s boxes. Tiny Footballer Box. Circa 1968-69? This one is a classic Subbuteo spanner-in-the-works. It is a strange short lived box that stops what would be a simple transition between the final "folded ends" box of the 1960s old heavyweight era, and the new 1970s version. The layout of this lid matches the early 1970s style, except for the use of a very small logo. The top of the lid has a bigger expanse of green, and a black rectangular surround. 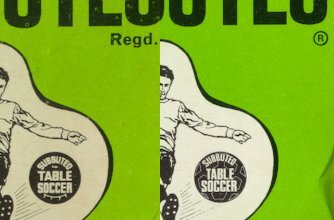 The sides of the box are white, but have the new Subbuteo logo matching the top of the box. The "OO scale Players" wording moved from the sides of the box to the ends, which is where it stayed on the 1970s long boxes. The insert is identical to the folded ends box above, with room for a metal rod goalkeeper with the new diving posture. Early 1970s Long Box. Circa 1969-73? These two boxes are identical except for the change in logo. The earlier version had the 1960s kicking logo (kicking to the left), but this was soon replaced by the 1970s logo (kicking to the right). I say shortly replaced, because the old logo is not too common on these boxes. On a random sample in my own collection, I came up with only 4 old logos among a sample of 35 boxes. These boxes will always house standard heavyweight teams. The green plastic goalkeeper rods first made their appearance in 1970, so were present through most of this era. That means that this style of box is more likely to have an insert adapted for this new style, with an extra hole cut for the thicker tail grip of the rod. However, teams produced in this box in 1969 would have had metal rods, and so the earlier inserts do still appear. I have metal rods in the 1970s logo box, and also plastic rods under the 1960s logo. Of course, as I've mentioned, teams and boxes get swapped so dating this way is fraught with difficulties. In addition to any team swapping, this is the box type that loses the team identity number most frequently. Few of these boxes are still numbered in my experience, and so judging when the box stopped being used is difficult. Personally, I don't have any numbered boxes of this type past the 40s! However, I have seen this box numbered as far as 80, which is the 76-81 expansion introduced in 1971-72 (although personally all mine from this range are in the later mid-1970s long box). After that year, the teams expanded quickly to 106 in 1972-73 and 165 in 1973-74. Were these expansions produced in this box? The 1970s logo version seems to be the one used for named 1970 World Cup teams. Does anyone have these with the earlier logo? These boxes are shown in the 1974-75 catalogue, and are another common "long box" type (i.e. They are the same size as the earlier boxes - i.e. 215mm x 93mm x 30mm). These boxes will always house standard heavyweight teams with plastic handled goalkeepers. 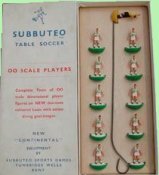 Although they seem to have had quite a short life, Subbuteo teams and production was expanding massively at this time, and in my view, they are the most common heavyweight box. The card used here was thinner than previous boxes. This makes the box look neater if it is in good condition, but it also makes it weaker. So crushed lids, and broken ends are common. Again, the number stickers are often missing, but more seem to stick around than on the early 1970s box. This type of box was used up until team reference 190, which is partly why that is seen as a good stopping point for heavyweight collectors. In fact, the Italian teams 501-528 were also produced in this box, as were the 191-195 teams of 1976 which were renumbered later (see Italian Production for details). April 2015: I've recently picked up a zombie ref 209 (West Ham Utd) in a numbered long box of this type. Other collectors have confirmed that they have also seen this era of team in the long box, although it is far from common. There is a small variation with the football in the logo, and also in the Regd. symbol. The "Regd" version is the one shown in the 1974-75 catalogue. This was the first change in team box size since the OO scale teams were first produced. Superficially, the exterior was little changed from the previous box, but the box was reduced to 190mm x 83mm x 30mm. Importantly, the interior of the box changed from card to moulded plastic. Like the previous box, there were two versions of the lid, despite the box only existing for a couple of years. The change was to the address, which switched from Tunbridge Wells to Chiddingstone Causeway, Tonbridge. There were also two variations to the interior, the early boxes allowed for both straight backed and diving goalkeepers, while the later ones only had room for the (by then standard) straight backed goalkeeper. This box saw a big increase in team numbers from 190 to 322. It also saw the arrival of the infamous zombie figure. Many of the teams in this expansion were for continental leagues little known by British buyers. For collectors this means lots of rare teams, which when they do turn up, can be in the wrong figure. A good reason to stick to 1-190 perhaps. Even in the 1970s, if you wanted to know which type of player you were getting (and for some it was very important), then you had to open the boxes in the shop. Perhaps feedback from annoyed shopkeepers lead to the next style of box (see below). These boxes can still be found with the bottom tray shrink-wrapped. I'm not sure if they all were, but certainly a few mint teams exist in this condition. I've also seen the odd team with the whole box shrink-wrapped. If that is genuine, then it creates an interesting dilemma. Is the team worth more like that, even though it might have a zombie in it? There is a slightly bigger version of this box, which appears to be an Italian issue. I own three, and they all have hybrid teams in them. The Portuguese production was also released in this style of box, although the printing and build is of a lower quality. Single Figure Window Box 1979-81. There were two variations to this box as well. On the first, the cardboard was simply an open ended wrap. The green plastic tray was visible at the ends of the box, and had a sticker with the reference number on one end (sometimes both ends). These teams were always shrink wrapped, but once opened, there was nothing to stop the figure in the little window from falling out. The sticker on the end faces forwards on top of the box as you look down. Sadly, this means that the number is upside-down if you stack them on a shelf. 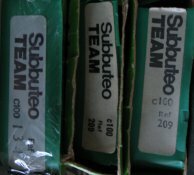 The accessory code (C100) and team number were printed in at least three variations on the end (see above). As well as leaving one player to fall out, the other trouble with these boxes was that plastic tray took all the weight. It did not help that the tray was thin and not very flexible, and cracks at the corners (and elsewhere) would soon occur. 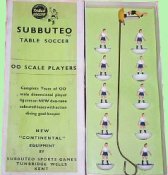 Pleasingly, It did not take long for Subbuteo to produce a second, improved version. Here the cardboard sleeve was redesigned with tuck-in end flaps and a cellophane panel under the window to prevent the player's escape. The plastic trays in this version are a different shade of green, and although made from an even thinner plastic, they are more flexible. Boxes could still be crushed, but at least the interior was less prone to splits. The above picture shows three versions of interior. The one on the left is from the early "open ended" version of this box, and the other two are from the later boxes. Note that the inner eventually loses the surround around the "windowed" player. With the second version of the box, the reference stickers were now stuck on the card end flaps, and not the tray. A sensible arrangement, except that the flaps can be torn off. Initially, the stickers were identical to those on the wrap boxes, and usually appeared on both ends of the box. However, some when in 1980, the boxes started getting a new label, which for the first time mentioned both reference number, and team names. It is hard to date the smaller changes within these boxes because teams remained pretty much the same in 1978-79. A few new teams appeared in 1980, and these seem limited to the later style of box (with the flaps and cellophane). These 1980 teams can appear with the old labels, or the new named ones. Sometimes they have both labels - one on each end, although later teams have just the name tag. All boxes can have any of the three player types within - heavyweight, zombie, or lightweight. The 1980 boxes/teams are much more likely to be lightweights - even more so with the named boxes. However, I do have at least one of these late boxes with a heavyweight in it, so this is certainly possible. 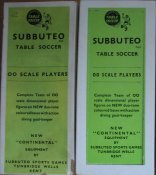 1980 was also the last date that every team reference was still in the catalogues, and what is also clear is that Subbuteo were still producing every single reference to this date. Even with the named boxes, if the reference did not have a team attached the number was printed on, and the rest of the label was left blank. The 1981 catalogue introduced the new horizontal box (see below) with a big fanfare, but originally only the world cup teams were due to be produced in the new box. This means that all the 1981 teams were still produced in this older style. English sides such as Spurs (352), Watford (354), and West Ham (355 and 357) are all quite common in these boxes (with name stickers). The 1981 catalogue reached 359, with 501-509 produced for the Italian market. After this though, things get a little tricky, as I also own a 404 Kuwait. Okay, so this team was not initially catalogued, and was probably produced prior to the 1982 World Cup, but it suggests that teams up to this number may also appear in these boxes. Special variations on 1970s boxes. 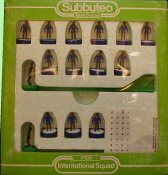 Subbuteo first attempt at a special boxed team was C138 which was an England side produced in 1976 only. This box was based on the "type 6" above, being 215mm x 93mm x 30mm, with a cardboard interior. When the C100 boxes were reduced in size in 1977, the C138 box design was reproduced in this smaller size to become part of the C500 range of home international sides. (i.e. England, Scotland, Wales, and Northern Ireland). This range was available circa 1977-79, and was the replaced briefly by C165, the home internationals pack. The England team used for this set was the one in C138, and went on to become 317. Scotland had briefly been 193 in the Italian catalogues, and when C500 ceased it became 318. Likewise, Wales was 192 in Italy in 1976, and finally became 319. Northern Ireland seems to have two versions. The first used 157 (i.e. with white shorts) while the later version had green shorts. This later version became 320 when the C500 teams stopped. As an extra, there is a fifth team in the range - the England away kit that eventually became 321. This appeared in the standard England box, but with a "2nd strip" sticker on the end. As mentioned on the accessory pages, C100S were available in Italy in the early 1980s, and featured teams painted to a higher level of accuracy - well that was the theory. These teams were produced in a replica of the final long box (with card interior), but the colours of the box matched the colours of the team, and the footballer logo wore the correct strip. Don't these boxes seem tempting? Details of the teams involved can be found on the Italian Production page. This box displayed the whole team for the first time. It was first advertised in the 1981 catalogue, as being available only for the finalists of the 1982 World Cup to be played in Spain. However, the box went on to be used for the whole range of teams until the number change circa 1984. This box measured approx 200mm x 140mm x 25mm. Instead of the flimsy plastic of the previous era, the inners were now made of polystyrene. This was light, but tough, and made for an attractive product with little chance of crushing damage. First up, there is the Tonbridge "World Cup 1982" box. This is the earliest version, and is the one shown in the 1981 catalogue (although that "prototype" was shown with a plastic inner, not a polystyrene one). This box has a back panel showing the teams in the World Cup qualifying draw - along with Subbuteo numbers where available i.e. 25 African nations are shown, but only Zaire (176), Morocco (158), and Tunisia (1) have Subbuteo numbers assigned to them. The 1981 catalogue stated that this box would be used for a World Cup range, consisting of the sides who qualified for the World Cup. It gave a list of teams that were currently trying to qualify for the World Cup, and stated that the range would be drawn from this list. In practise, although the World Cup teams seem to be most common references found in this box, interestingly, they seem to relate to the earlier "qualifying" range, rather than the actual qualifiers. So teams like Holland (ref 13) and Canada (ref 41), appear in this style, although they did not make it to the World Cup. In addition, although it was stated that this box was for World Cup teams only, the American poster catalogue from 1982 clearly shows a NASL team in this box, so perhaps usage became more widespread. The second box shown is a Tyne and Wear addressed "World Cup Team" box. The corner strips in the colours of the Spanish flag are a nice touch. I assume the address change prompted this redesign. Again, this should be a box that was only produced for the twenty four teams that qualified for the 1982 World Cup, and it is more likely that this was actually the case this time. 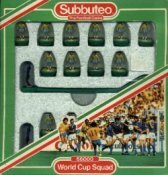 This 1982 box was produced closer to the World Cup, so the back panel now showed the draw of the World Cup finals themselves, with every team having a Subbuteo reference number. This included sides new to Subbuteo - Cameroon (403), Algeria (402), Kuwait (404) and Honduras (405). The Tonbridge version can have the USA and Canadian patent numbers on the back (4211408 and 284926 respectively). I assume this was to do with the Jokari/NASL export market. The address/details on the back panel can be printed in white (as illustrated above) or black. Leeds address boxes with Fabrique en Grande Bretagne on the bottom of the address, and contient Equipe de 11 joueurs on the side. The name stickers are initially the same style as those on the final single window boxes. However, some bright spark had the idea of using green labels during this period. Nice idea, but the name becomes unreadable. Some boxes have also been sighted with a narrow white label, although these are not common. This box appeared when the Waddingtons re-number came into effect in 1984, and lasted throughout the rest of the 1980s. The box was the same size as the horizontal box, but the team had shifted position. Like the horizontal version, the reverse of the box was used for advertising. I've found two variations of this, and they are displayed above. Note that the words under the logo also change from "Table Soccer" to "The Football Game". The final teams to be produced in this box were in the 1990 range, which took the team list up to 712. Straightforward white name stickers on all of these boxes. The final picture shows the "Christmas Tree" interior. This plastic alternative is found on teams boxed under licence in Greece. The larger squad boxes featured two goalkeepers and 14 outfield players. The first version was the P100 International Squad, which was produced around 1982-83, and is theoretically available for most of the teams of that era. The illustration here suggests that the team was supplied with a squad number sheet (C206). These teams seem more common in Italy than the UK, and feature in the 1982-83 Italian catalogue. A similar World Cup squad box was issued for the teams in both 1986 and 1990 World Cups. These teams were given 66000 numbers instead of the usual 63000 ones. The biggest variation in this era is with the box interior. Originally (circa 1990-92), the box had a white polystyrene interior and a polythene window, which was stuck to the inside of the box just like the 1980s boxes. From 1993-95, the interior changed to green plastic, with a clear plastic lid to prevent the figures from falling out. The polythene interior has a further variation, in that a few were produced with a different shaped insert, and a plastic lid. These boxes (which seem to be circa 1990), had a lower tray with rectangular player indents, and a lid with ridges that supported the players in their positions. I assume the standard version proved to be a simpler/cheaper alternative. A final Waddingtons box was designed for the first year of Premiership tie-up in 1995. 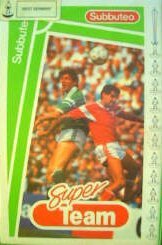 This was similar to the usual box of the period, but had the action picture replaced by the Premier League logo. For this box, the interior was produced in clear plastic, and this was backed by a piece of paper displaying more of this logo. It looked very effective, although it was tricky to get the paper back in the box, so they are now often missing. This box was only used for a single season (as Hasbro took over in 1996). This means that there are just 27 kits to pick up in this box. (20 teams, 6 second kits, and a third kit). Note the team badge displayed on the name sticker for the first time. The third box shown was issued in 1990 and was designed to look like a video cassette. It was produced for a select number of teams (about 25). Although these were described as "Super Teams", the teams themselves were no different to those in other boxes. Although some of the earlier teams have a smaller sticker that stops short. If the flap inside the sealed end gets bent upwards, it becomes a bugger to get the interior back in the box. Some of the teams in the later green plastic trays have 63xxx numbers on the white sticker. So my 1993-94 Ipswich is 781, but my 1995 version is 63781. Super team Appendix gives more details on the teams in this type of box. Super teams have a small sticker on the top showing the team name and an illustration of the colours. However, blank Super team boxes did turn up in Italy in the collecting era. This final set of boxes were designed to hold teams produced with flat Hasbro bases. The two boxes from the late 1990s (shown on the left) were very similar in design to the Waddingtons versions, except that now only two of the figures were visible, and these were in special windows that show the kit design. The reason for this was that the teams now needed to be assembled by the owner, and so the rest of the players and bases came in two clear polythene bags, initially stored in a central space within the newly designed interior. This interior still had room for ten assembled players around the outside, although the spaces were a bit tight (the new lower profile base helped). The goalkeeper reused the central space. A big advantage with these teams was that Hasbro provided eleven outfield players, so you had a spare if one broke. It didn't provide a space to store this substitute though, so one figure has to stay in the window (with his base rattling around loose). Amusingly, although teams are said to include eleven outfield players, I find that Hasbro seem to be confused by the two players in the windows, and you often received twelve, or even thirteen players in a set. Mind you, I've also had two goalkeepers, and once got twenty-two bases in the bag instead of eleven. There was also a "Special Edition" England box, which did not have any windows, but it did have the kit design illustrated on box. This was for England's 1998 World Cup kit. The final box shown is the red and green design, produced for the 2000/2001 series of teams. Just ten kits were produced in this box. A mistake in production of the Hasbro box interior exists, where the space for the tail of the goalkeeper rod is too small. In these boxes, the goalkeeper only fits unassembled, with the rod facing the wrong way. That concludes my in depth look at team boxes. I hope it wasn't too dull, and that it proves some help in dating old teams. If you find yourself strangely needing to check the adverts on the back of your team boxes, then I'd better apologise for mentioning it. You can get back to the main pages of the team project by clicking on the links below.